The most frequent reason for performing a total hip replacement (THR) is relief of pain and disability caused by severe degenerative joint disease secondary to hip dysplasia. Other reasons include hip fractures, chronic dislocation of the hip and acute dislocation of the hip that cannot be reduced because of hip dysplasia or soft tissue damage. The presence of any and all of the aforementioned conditions leads to hip joint laxity, subluxation (partial dislocation) and or luxation (complete dislocation) which ultimately leads to varying degrees of degenerative arthritic change. Contrary to what one may think, many dogs with arthritic hip joints seem to function normally while others exhibit severe crippling disease. In addition, the severity of the clinical signs does not necessarily correlate with the degree of radiographic or pathologic changes seen. Breed and individual differences in temperament may also affect the amount of discomfort exhibited. Total hip replacement is now a well-established procedure in veterinary orthopedic surgery. Although there are some variations in technique and types of implant, most involve the replacement of the acetabulum with an ultra-high molecular weight polyethylene cup and the femoral head with a cobalt chrome ball and stem which are secured in position with acrylic (cemented) or porous coated implants resulting in normal or near normal function and activity. Clinical signs including lameness, reluctance to exercise and difficulty rising, using the stairs or jumping into and/or out of the car are often signs of hip related problems. Lameness of the hind limb varies from barely-detectable gait abnormalities to non-weight-bearing lameness. Lameness is usually especially evident after exercise periods. A “bunny-hopping” gait is often seen in affected young dogs and is characterized by simultaneous advancement of both hind limbs while running. Young dysplastic dogs often lay on their belly with limbs outstretched behind them. Pain is often elicited during full extension of the joint by a veterinarian. Hip dysplasia is not generally an acute lameness, but one of the slow progression of lameness severity. It is not uncommon for dogs with hip osteoarthritis to have in addition, other orthopedic injuries. Many times it is these other problems that are the source of the lameness that prompted the visit to the veterinarian in the first place. The most common conditions which may mimic or be confused with clinically painful hips include cauda equine syndrome, cranial cruciate ligament tears, other rear limb arthritic conditions and neoplasia. 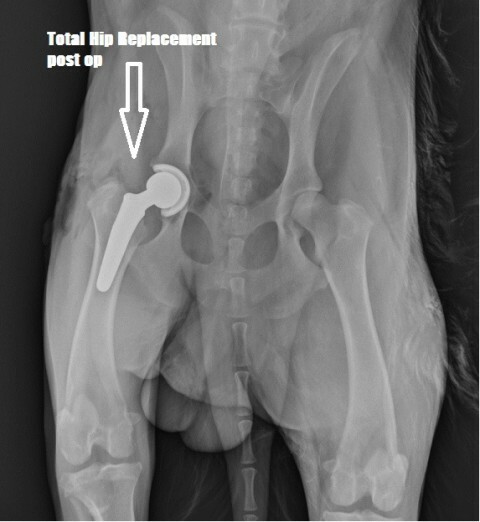 Since dogs can have profound radiographic changes with arthritis and yet have few if any symptoms, any new lameness exhibited by such a dog, or sudden worsening of what had heretofore been a mild lameness, should prompt skepticism that it is due to the hips until proven to be so. Only when other causes have been excluded or treated should attention be focused on the hips and medical and surgical treatment such as THR be contemplated. 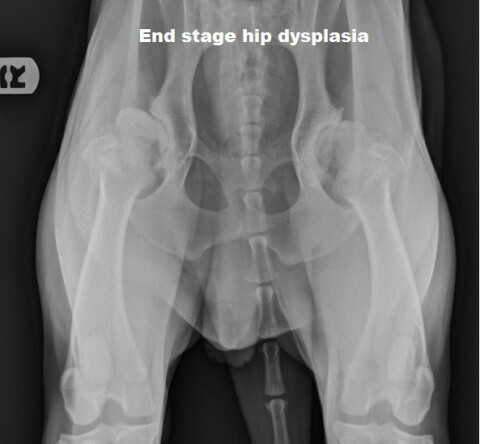 Not all dogs with hip dysplasia or osteoarthritis require surgical treatment. The decision for performing a THR and the timing for joint replacement surgery depends on a number of factors, including the degree of clinical disability and discomfort, intended use of the dog, and the presence of other diseases or injuries. As mentioned previously the decision to perform THR is never based on radiographs alone, no matter how severe the changes appear. There can be a poor correlation between radiographic severity and clinical severity, and some dogs with terrible looking hips are yet functioning at a high athletic level with no apparent pain. So the decision to treat arthritic hips, with medicine or surgery, is always based on whatever clinical disability the patient is exhibiting. Medical management to alleviate clinical symptoms is always attempted prior to surgical intervention as many dogs with degenerative arthritis can be kept comfortable and active with medical management. It is important to keep the patient at a normal body weight and to provide regular, controlled activity. Medical management includes the administration of steroidal or non-steroidal anti-inflammatories, muscle relaxants, poly-sulfated glycosaminoglycans (Adequan), hyaluronic acid (Legend), neutraceuticals (glucosamine, chondroitin, msm, creatine), omega 3 and 6 essential fatty acids, platelet rich plasma, Class IV laser therapy, acupuncture and physical therapy. If hip pain persists in spite of appropriate medical management, surgical therapy should be considered. The decision to intervene with surgery is based on the amount of pain, discomfort and lameness exhibited by the dog. Typically the patient has been refractory to medical therapy or has not returned to an acceptable level of performance. The decision to proceed with surgery should not wait until there is severe pain and/or loss of muscle mass as this may compromise the surgical result. Since total hip replacement results in near normal to normal function and activity, if medical treatment does not alleviate clinical symptoms, then surgical treatment is recommended. Surgical options include femoral head and neck ostectomy (FHO) with or without a biceps sling or total hip replacement. While the purpose of this article is THR, it is appropriate to diverge and mention the FHO procedure as this has been the contemporary surgical option to treat coxofemoral pathology in smaller dogs and cats. An FHO with a biceps sling removes the femoral head and interposes muscle between the acetabulum and femoral neck so that there is no longer bone rubbing on bone in the diseased joint. While this can relieve much of the pain, the loss of the normal ball-and-socket anatomic structure of the hip may result in a limb that will not function normal mechanically. Small, light-weight dogs and cats do better than large dogs with an FHO. The advantages of FHO include easier recovery, less risky complications, and less expense. If a femoral head and neck excision was performed previously, the results of total hip replacement are generally not as rewarding as cases receiving hip replacement initially. An FHO can be converted into a total hip replacement, however, it is a technically demanding procedure with a higher complication rate than primary total hip replacement. The longer the interval from the FHO to the total hip, the more difficult the total hip replacement becomes, with the best results occurring if the total hip replacement is performed early (4-6 weeks) after the FHO. Conversion of an FHO to a THR should not be recommended, as calcar support for the prosthesis is removed by the excision arthroplasty, there is a higher risk of infection and there may be inadequate muscular support for the prosthesis. After FHO, especially in large dogs, the hindlimb is shortened to a variable degree, biomechanical function is altered, pain relief may be unpredictable, muscle atrophy with weakness is a common long-term finding and postoperative rehabilitation is prolonged. On the contrary, published reports of objective measures taken following THR in large dogs consistently document a return to normal function. The goal of THR is a pain-free joint that mimics normal biomechanics with excellent long-term function. THR is a common procedure used to treat degenerative arthritis and other hip arthropathies in large dogs, and it should be considered in smaller patients. Total hip replacement has historically been used in medium, large and giant breed dogs. There is now a much wider range of implant sizes, so it is available for small dogs as well. Truly, the only drawback to the utilization of THR in smaller patients is its expense and the fact that these smaller implants are usually cemented rather than porous-coated. 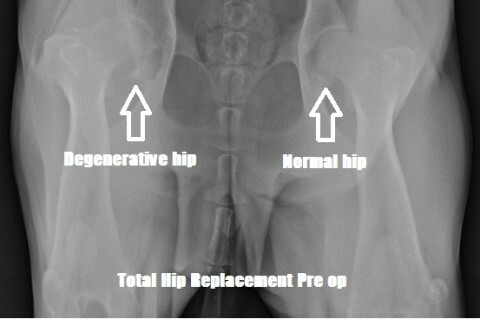 Total hip replacement techniques fall into two categories: Cemented and Cementless. Cemented THR provides fine short term, but less satisfactory long term outcomes. Cemented implants are held in place with an acrylic, but there may be break down of the interface between the cement and bone over time. For this reason, in the past, total hip replacement was only considered in older dogs. This was due to concerns with how long the cemented implants would remain stable. With the uncemented, porous-coated implants that we now use, break-down of the interface is unlikely and the high quality of the plastic of the cup will help it last for the life of the dog. Porous-coated implants become stable by in-growth of bone into their beaded surface in the first few weeks to months after implantation. Implants can be placed in young dogs with the expectation that they will provide a lifetime of pain-free function, and are preferentially indicated for hip replacement in young dogs. In many dogs, both hips are arthritic. In most cases, the hip with the worse function is operated on first. This results in good to excellent function in about 75 percent of dogs. The other 25 percent remain somewhat lame on the opposite hip, and total hip replacement of the other side is considered in these cases. Both hips are never operated upon at the same time because bilateral surgery increases discomfort and the risk of complications. For this reason the two surgeries are separated by approximately 3-4 months in most cases. If function is good after the worse hip is replaced, the second hip may not need surgery and continued medical management may continue to alleviate clinical symptoms. Dislocation of the prosthetic joint is rare, and is most likely to occur in the first 4 weeks after surgery. It may be corrected manually, but another surgery is often necessary. Infection is a serious potential problem. If it occurs in the area of the wound, it is generally treated with antibiotics. If it occurs in the bone, removal of the prosthesis may be necessary. Subsidence or sinking of the stem – a small amount of settling of the stem has no effect on function of the prosthetic joint. A large amount of subsidence or stem rotation may require surgical revision of the stem. Fissure or Fracture of the femur – uncemented implants are hammered into place. Fissures can develop. If they are seen during surgery, wire is placed to prevent them from expanding. If they develop after surgery, they may lead to subsidence of the stem, or fracture of the bone. Another surgery would be required to manage this issue. Loosening of the prosthesis is an uncommon problem with uncemented prostheses. If loosening is significant or progressive, the implant may need to be replaced or removed. Most dogs are able to stand and walk on the new prosthesis within the first few days after surgery. While hospitalized, exercise is restricted to cage confinement with 10 to 15 minute walks under leash restraint twice daily. 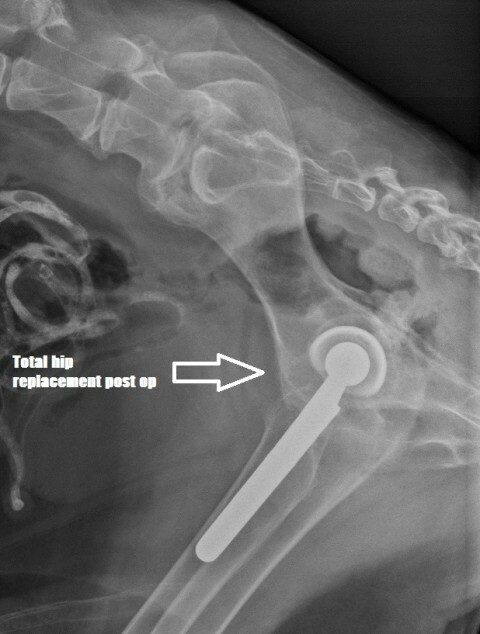 Most animals undergoing total hip replacement are hospitalized for a total of 3 to 4 days. During the first month at home, the dog must have very limited activity. During this crucial period the joint capsule, muscles and tendons are healing, and helping to stabilize the hip. This means that dogs are allowed short walks only, and only on a leash. Otherwise the dog should be kept confined. Dogs should not run, play, jump, or climb flights of stairs. During this time, care should be taken to avoid activity on slippery surfaces, and stairs should be climbed only while the dog is under the direct control of the owner. Going up and down one or two steps to get outside is acceptable. Management at home will require strict supervision, and activity must be restricted in order to optimize surgical recovery. Adherence to postoperative restrictions can minimize potential complication. One month after surgery, supervised exercise can be gradually increased over the next 4 weeks. During this second month dogs are still limited in their activity, but can start increasing the length of their walks outside. At the end of 8 weeks, more normal activity is allowed. Between the second and third month activity is gradually increased so that by the end of the third month the dog is nearly back to normal function and activity. Vigorous, rough play or hard work is allowed after gaining strength and conditioning. Radiographic evaluation and orthopedic examination are necessary at 3 and 6 months after surgery, and every 2 years thereafter. This provides a history of the patient’s progress and may help to detect potential complications. The majority of dogs are found to be more comfortable and have an improved quality of life following THR. Many owners report that their pet can do things they have not done since they were a puppy. Increase in muscle mass, improved hip motion, and increased activity levels are observed in most patients. 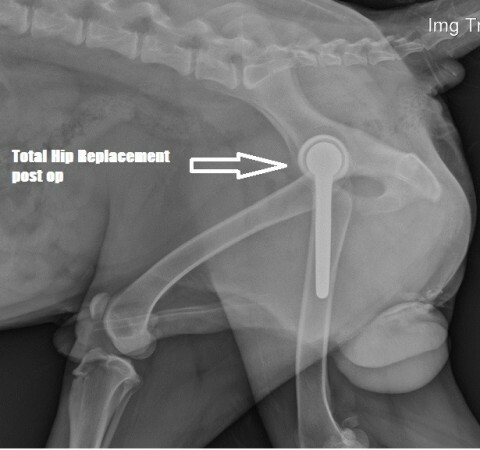 Up to 95% of the dogs whose hips have been replaced return to normal or near normal ambulatory function. More than 95% of owners feel that their dog’s quality of life is significantly improved following THR. Although the state-of the-art equipment, implants, advanced technical expertise and training which go into the THR surgery are expensive, few other procedures are capable of so dramatically changing the quality of a pet’s life. It is for these reasons that THR is the surgical treatment of choice in both juvenile and adult dogs to obtain the best functional outcome when the pain and discomfort of degenerative arthritis is refractory to medical therapy.